The merits of voting have come under scrutiny as of late, thanks in part to Russell Brand’s comments on the topic in his guest edited edition of the New Statesman. (Oh and I think there might have been an interview as well.) I’m highly suspicious of voting as well, which is why my ballots are mostly blank except for the one or two things I think might be strategically useful in later direct action. I voted earlier this week in a local election because my city is still small enough that there are very real and tangible differences to electing one counsel person over another: One city council person authorizes citizen working groups to organize municipal composting while another led the charge to close an indy media center that hosted an Iraqi artist because… terrorism. A lot has already been said about the efficacy of voting and why it alone cannot possibly bring about the fundamental change that politicians promise. Besides, if you’ve read your Zinn, you know that all the important stuff happens between elections anyway. What I want to touch on today however, has less to do with government elections, and more to do with the abstract concept of voting. Why is it that, if voting is implemented within a system, do we automatically assume that it is more democratic? What happens to social networks and web platforms when we install voting as the overriding system of displaying public opinion? Why shouldn’t the critique of voting in general be directly imported as a critique of the social networking sites that use voting as the primary form of interaction on the site? Strict up or down votes are a relatively recent invention. They were first and most widely used in armies that needed to choose a new leader from amongst themselves. This makes sense if you consider what voting actually means: choosing among several discrete options with the full expectation that some people —sometimes even more than half— will feel as though they did not get their way. Unless they’re the product of consensus and comprise, group decisions must be enforced through sanctions or punishments. Organizations like militaries have the strict chains of command and ready access to deadly force that are necessary for such decision-making. If you ask most radical leftists why they don’t vote its mainly for this reason. Not only are the limited options woefully inadequate, but the very idea that one side loses while the other side wins is undergirded by the promise of violence. Is is disturbing then to think that voting —at least in the West— is widely perceived as not just a governmental process, but as a synecdoche for democracy. Sometimes other actions are rhetorically transmuted into “voting” so as to imbue some larger social structures with democratic features. We are said to “vote with our dollars” as consumers under capitalism, and we “vote with out feet” when we abandon a declining neighborhood. Watch a People’s Choice Award acceptance speech and you’ll hear a lot about what “the people really want” in their musicians and entertainment. Given the underlying structural violence that keeps capitalism in place, perhaps phrases like “voting with your wallet” are actually more accurate than most people realize. Social media sites that heavily employ voting as part of the user experience often go heavy on the democratic rhetoric as well. Reddit’s vote-based system of arranging stories elevates it from “news aggregator” to democracy’s digital white savior. Alexis Ohanian, one of the founders of Reddit, has been described as the “Mayor of the Internet” and goes on speaking tours about how sites like his are evidence of the Internet’s capacity for self-governance. The users themselves are also quick to call Reddit a democracy. If a news story (or, lets be real, a cat video) ends up on the Front Page, we are supposed to take that as a message of collective, public opinion. This is an enticingly simple model and some news sites like PolicyMic have taken to implementing similar voting systems to organize comments and stories on their own site. Curiously, sites like Tumblr or Pintrest, which are arguably no less “democratic” but far less reliant on numerically ranking content, are not so quickly and readily described as such. These sites are also —and as I will explain in a moment— uncoincidently used by more marginal populations. While the average Reddit user is a 20-something American male, just about every other social media network has a majority of women and popular sites like Twitter and Instagram have many people of color from urban counties. Its difficult to say whether its causative or simply a correlative trend but the relationship is clear nevertheless: sites that rely heavily on simple voting (Reddit, Stack Overflow, Hacker news ) have much higher percentages of male users. Perhaps the design solutions necessary to sufficiently discourage racism on Reddit would make it unrecognizable. A web platform that relies so heavily on quantifiable upvotes, comments, and karma might very well encourage undesirable behavior. Things that are shocking or provocative garner a lot of attention, which almost always translates into karmic rewards. It might be worth comparing the quantification-heavy design of Reddit with the virtually number-less Tumblr interface. The flip side of that observation is that undesirable behavior can be reinforced through majoritarian voting only when the undesirable behavior is held by a majority of people. Then again, its hard to tell if white young males are attracted to a site that is set up to reward their view of the world, or if Reddit is populated by young white males because it comports so well with what they think see as the optimal method of aggregating public opinion. Its easy to see voting as inherently democratic when you never encountered a voting system that is set up to disenfranchise you. Perhaps it is time to apply the critique of voting to our social media networks. Voting leads to more homogenized user bases and rather than encouraging different points of view, demands that one win above all others. I will treat Reddit like I treat my local ballot: use voting as a tactic to support allies and future efforts at direct action. David is on Twitter, Tumblr, and yes- even Reddit. I recognize that there are many different kinds of voting, some of which are far better than others. Preferential, instant-runoff, and ranked voting all have their relative merits but for the sake of this post I’m referring to the kind of voting that dominates in the United States and Great Britain. For state and national elections, I’m an avowed party-line voter for the Rent is Too Damn High party. The fact that that is a joke, should disturb you greatly. This can't be serious, right? 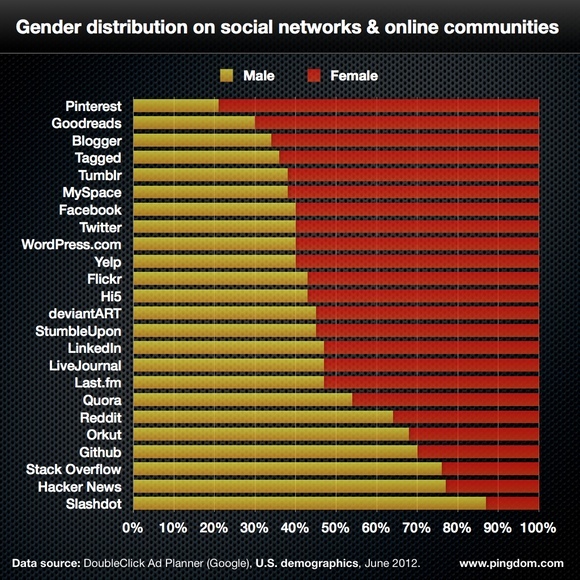 The top four sites are exclusively focused on the male-dominated tech industries. I mean, Stack Overflow for a community specifically geared towards programming-related questions. Considering that one BLS statistic notes that only about 20% of software engineers are women, it's not surprising to expect Stack Overflow to be about 80% male. It's not the concept of voting alone that tends to homogenize. It's (as you mentioned) the "up or down" type voting. It's the limited number of choices on the ballot that homogenize. As many choices as possible shy of overwhelming the voter would be better. Unlimited choices through write-in candidates (especially with instant runoff) can do wonders. It's not enough for voters to select from a top-down pre-sanctioned list of options. The voter needs to bring new options to the election also. It's much more feasible given modern communication and computing technology. Voting is superior to dictatorship (and even superior to the fantasy of meritocracy) in many ways for getting at the greatest good for the greatest number of people or just keeping the peace. But in some circumstances, the group has to make a quick decision for the survival of the group, and doesn't have time to hold an election. Diversity for the sake of diversity shouldn't be the goal. Diversity for the sake of giving every idea a chance to compete should be the goal. It's not about diversity of genes as much as it's about diversity of memes. Competition is unavoidable. Ideas must compete for a majority of people to benefit from the best idea. A war between memes is less costly and less painful than a war between genes. Github's place in the list makes ArtSmart Consult's explanation fit the data while yours does not fit it. Also, reddit is based on first-come-first-served moderation powers within "subreddits," with users having the ability to subscribe and unsubscribe to these subreddits. It is not a simple voting system. And facebook also has voting ("likes").